Nothing lasts longer with lower maintenance than a Slate steel roof. 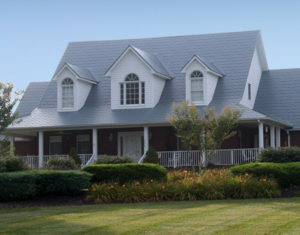 A talented team of engineers (backed by over six decades of experience in the design and manufacturing of high quality building products) have taken every measure to ensure that Slate metal roofing withstands severe weather changes free from unsightly panel distortion, breakage, or ‘shedding’ like traditional slate materials. Slate steel roof is available in four colors to complement new homes as well as remodeling projects. Extreme Durability Slate steel roofing is coated with Kynar 500®, the industry’s premium finish, which is corrosion-resistant, withstands even the harshest outdoor conditions for decades and has superior color retention. We back our product with the industry’s best warranty. Period.